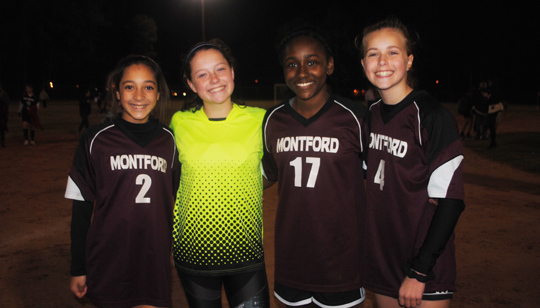 On January 28, the Montford Middle School girls soccer team exhibited their skills and teamwork by winning against Ft. Braden (8-0) at James Messer Park. This is the second consecutive game that the Montford mustangs have won, beating Nims last week (4-0). Even to the end of the game, players continued to exhibit great teamwork, passion, and high energy. Meredith Gulde (#14), who scored the winning goal, explained that what she enjoys most about soccer is “running around the field and connecting with everyone that I’m playing with”. She added, “the feeling I get when having the ball is an amazing feeling that I don’t get from anything else”. She aspires to play soccer throughout high school and college, taking inspiration from the U.S. women’s national team. Meredith Gulde (#14) who won the winning goal. When asked why he enjoys coaching soccer, Coach Alex Swart said, “I just love the sport and the team work. I especially like coaching this age group because they are still getting to know themselves and are discovering comradery.” Coach Swart grew up playing soccer and continues to pursue his passion in the sport, as exhibited in winning three championships in the past ten years. The biggest challenge to the team this year will be working with new players, as well as working without some of the players that have either graduated to high school or are out this season due to injuries unrelated to soccer. Coach Swart encourages players to play positions they have never played before so that they can learn who works best together. Getting the younger players out on the field as much as possible will be one goal for the Montford team. 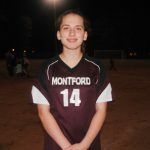 Hopefully, with good team work and determination, the Montford girls soccer team will go on to the Championship as they did last year.